"A one-dish casserole with all of your Sunday morning favorites." Preheat oven to 325 degrees F (165 degrees C). Grease an 8x11-inch baking dish. Cook and stir breakfast sausage in a skillet over medium heat until browned and crumbly, about 10 minutes; drain excess grease. Mix green onion into sausage and spread mixture over bottom of the prepared baking dish. 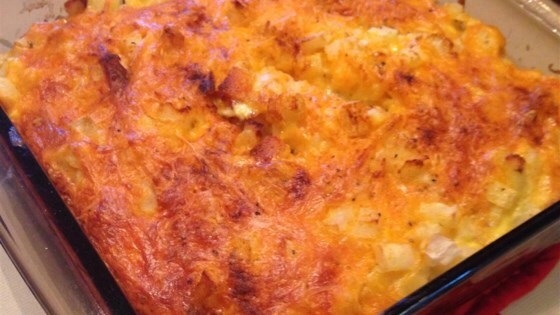 Spread hash brown potatoes in a layer over sausage; top with Cheddar cheese. Whisk eggs, milk, and gravy mix together in a bowl until smooth; pour over casserole. Season with paprika. Bake in the preheated oven until a knife inserted into the center of the casserole comes out clean, about 1 hour. Let stand 10 minutes to firm up before serving. A hearty potato, sausage, and egg casserole that's perfect for Sunday brunch. I made this recipe for dinner tonight and my family and I loved it! I didn't use the green peppers or paprika and all I had was sharp cheddar cheese but it was delicious just the same.